Is it just me? Every time I hear or see the phrase ‘Dress like a detective’ (that’s every day this month then, as I’ve been doing the SWAN UK Instagram Challenge), I want to sing it to the tune of ‘Walk like an Egyptian’. No? Just me then. That’s okay, I’m used to not fitting in. I can’t really describe her delight at finding someone like her. (In the middle of Ikea, of all places). What must it be like to not know anyone ‘like you’ except your teddy? (And all credit to whoever gave that little girl a tube-feeding teddy). To not only not feel ‘normal’, but to not know anyone you could fit in with? For a long time, Benjamin didn’t fit anywhere either. His physio said he had ‘symptoms of cerebral palsy’ – but not cerebral palsy. His neurologist said he would ‘likely have epilepsy’ – but he didn’t have epilepsy (he does now). His ophthalmologist said he was ‘probably visually impaired’ – but with someone as profoundly disabled as Benjamin he couldn’t actually tell. We didn’t know a child even remotely like Benjamin. I couldn’t find a website or a scientific paper that would tell me how he might develop, how much he would be able to do, how long he might live. And if Benjamin didn’t fit, I didn’t fit either. Haunted by the innocent yet infernal question, ‘What’s wrong with him?’ I would shy away, mumble something, shuffle my feet, then berate myself for not giving Benjamin the answer he deserved. Having had some success as a researcher in a past life, I turned Benjamin into my latest research project, scouring the internet for matching patterns of symptoms, following citation trails back through obscure journals. Only to find, not only that he didn’t fit, but that I felt like a failure. In fact, the only place we totally ‘fit’ is SWAN UK (Syndromes Without a Name). We fit here, because everyone is a misfit. All 2,000 families of us. All different, all undiagnosed (or once undiagnosed, or diagnosed with something so rare it might as well be undiagnosed). Finding SWAN UK was, at first, like that little girl finding Benjamin in Ikea. A sudden realisation that we were not the only ones. Over the years since, that sudden realisation has developed into a warm glow of acceptance. A knowledge that whatever hurdle we face, whatever question we have, another SWAN has probably been there already. Two thousand misfit families finding where they fit is great, it’s fantastic. I am so glad we’re one of them. But – here’s the amazing bit – 6,000 new undiagnosed children are born every year in the UK alone! That’s an awful lot of misfit children and families that don’t have anywhere to fit. That’s an awful lot of mums dancing alone in their kitchens to The Bangles and not knowing that thousands of other mums are dancing along too (or is it still just me?). That’s why – this Undiagnosed Children’s Day (Friday 28th April 2017) – SWAN UK is asking everyone to become a detective for the day. Help us find the thousands of other misfits out there. Help SWAN UK achieve its ambition of doubling its membership this year. You can help by sharing this post. You can help by tweeting with the hashtag #undiagnosed. 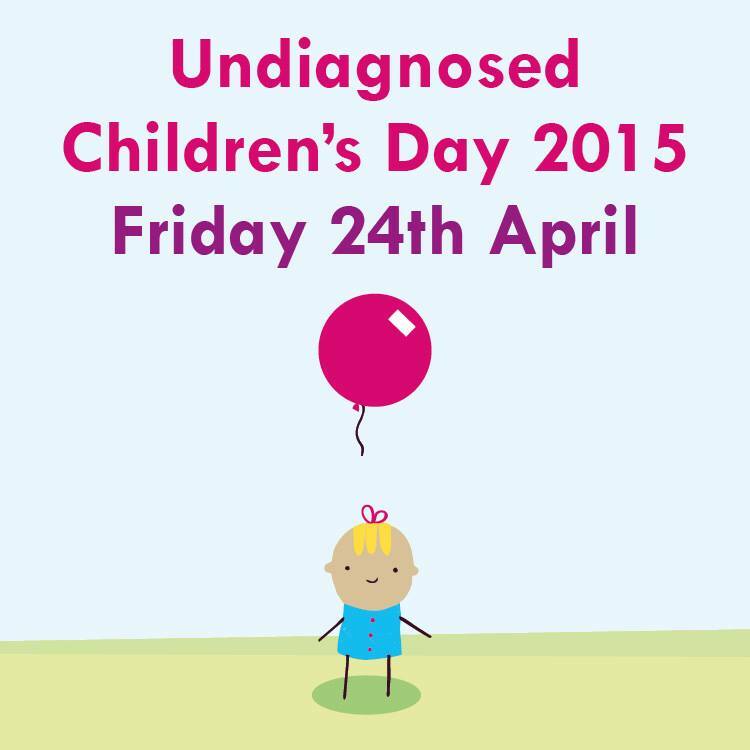 You can help by starting a conversation about Undiagnosed Children’s Day. You can (if you like) help by dressing up like a detective (or an Egyptian) and feeling, for yourself, like a total misfit for the day. If you find a family with an undiagnosed child, please point them in this direction (https://www.undiagnosed.org.uk/). If you can’t do any of these things, you can help by donating a small amount to SWAN UK (just text SWAN11 £3 (or any amount up to £10) to 70070). Thank you. SWAN UK isn’t the solution to all our problems. 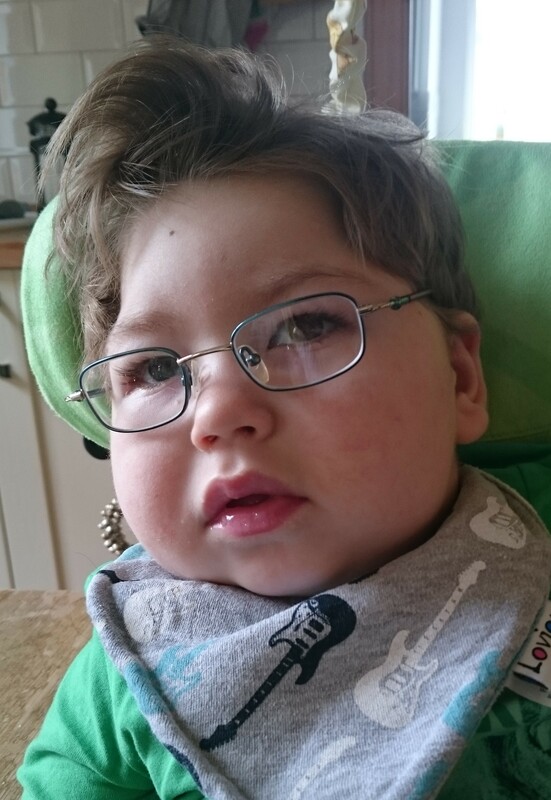 We’re still no closer to finding the cause of Benjamin’s condition. We’re still never going to be a ‘normal’ family. I’m still an angry old woman who shouts at people parked in disabled bays without a blue badge. I’m still an embarrassment to my children as I dance around the kitchen… but at least I know there’s another mum somewhere doing the same … isn’t there? Isn’t there? My daughter took this photo. Unfortunately it captures me perfectly. ‘Why do you ask that darling?’ ‘That’s what it said on the Whiteboard.’ The Whiteboard (capital W intentional) seems to be a modern-day oracle. So every morning this week we’ve fished out the Usborne First Bible and read through from the Last Supper to the Crucifixion, Resurrection, Ascension and right through to Pentecost and the coming of the Spirit before she’s happy. Happy that there’s a happy ending. Happy that everything has a reason. Except, not everything has a reason, a happy ending, or an answer. It can’t be long now before she moves on from ‘Why did Jesus have to die?’ to ‘Why is Benjamin disabled?’ And there neither my faith nor my science can help her. April 14th’s theme in the SWAN UK Instagram Photo Challenge is ‘medicine’. Medicine has done a lot for us, for Benjamin. It has shown us through MRI scans where his brain is malformed. It feeds him when he cannot feed himself. It soothes his tight muscles, prevents his seizures, minimises his reflux, clears his chest and reduces the number of bacterial infections he gets. When he is really poorly, medicine breathes for him. Without medicine, Benjamin undoubtedly would not be here. But medicine does not always have the answers. 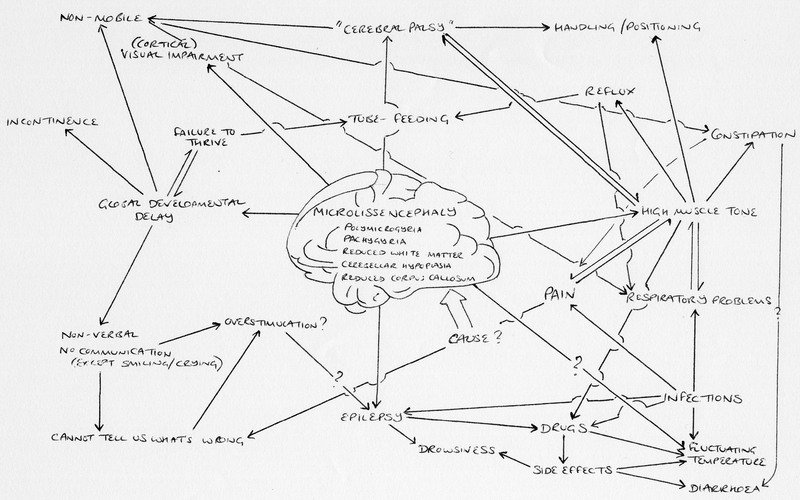 That’s what unites the members of SWAN (Syndromes Without a Name) UK: for us, medicine does not have all the answers. Medicine ˈmɛds(ə)n,ˈmɛdɪsɪn/ noun. The science or practice of the diagnosis, treatment, and prevention of disease. For SWAN children, medicine cannot, in fact, diagnose, treat, or prevent Benjamin’s disease. It cannot answer the question of why he is how he is. Before he was born, it could not tell us whether he would live or die, whether he would suffer or thrive. It still cannot tell us how his disease might progress or how long he will survive. A couple of years ago, a super-intelligent, professorial geneticist told us he would pull out all the stops and find the genetic cause for Benjamin’s condition. ‘Within six months,’ he predicted. So that we would know more about his prognosis. So that we could estimate how long we might have with him. So we could make an informed decision as to whether to have another child (good job we didn’t wait around for that one). We’re on the DDD (Deciphering Developmental Delay) study. We might soon be put on the ‘100,000 Genomes Project’. I can google lists of symptoms all day long and usually get either ‘we found 4,652 conditions featuring all those symptoms’ or ‘we found 0 conditions featuring all those symptoms’. Both of which are about equally useful really. Will medicine (or Google) ever provide an answer? Who knows? The DDD study is now printing out results letters daily. A third of those letters contain a probable diagnosis; two-thirds say they have found nothing at all. When Jackie asks me ‘Why did Jesus have to die?’ I have to admit I skirt around the answer. I don’t think she’s ready to know that we are all sinners, the meaning of atonement and the story of ‘the fall’. But I can skip to the ending and show her the empty tomb, the risen Lord, Easter bunnies and chocolate eggs. When Jackie asks me ‘Why is Benjamin disabled?’ what will I say? 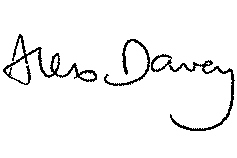 When the box on the DLA form says ‘diagnosis,’ what should I say? When the stranger in the supermarket asks ‘What’s wrong with him?’ What do I say? Thanks to SWAN UK, I know what to say, because when medicine doesn’t have the answers, often SWAN UK does. Through its community of parents who have been there before, SWAN provides the answers and more. When the box on the DLA form says ‘diagnosis’ I will attach a two-page document listing Benjamin’s symptoms, presentation, and the studies that he is on. I will not let ‘undiagnosed’ stand in the way of him getting the help to which he is entitled. © Mat Fascione. Licensed for reuse. April 29th 2016 is the fourth annual Undiagnosed Children’s Day, and it promises to be bigger than ever. It’s the third UCD since our own undiagnosed child, Benjamin, was born, and only the second since we found out that Undiagnosed Children’s Day and the initiative for undiagnosed children, SWAN UK, existed. A fitting time to look back over the past year and forward to the next. Many things have changed since our first UCD, not least Benjamin himself. A year ago, he was a frail baby, his 7¼ kilos dropping off the centile charts altogether. Now, he is a strapping, 13½-kilo toddler (can you call him a toddler if he doesn’t toddle? ), creeping over the 50th centile. For this we can mostly thank one big decision: that Benjy should have a gastrostomy. One year ago we were bottle-feeding him high-calorie milk his every waking moment and he was still not gaining weight, strength or energy. Tube-feeding has made a massive difference to all of us. Benjamin is thriving; he has energy to grow, to learn and to love. We have the time and energy to enjoy life and to enjoy him and our other children. A bigger boy, and a bigger character: he wears trendy glasses (a simple thing that has made a massive difference to Benjamin’s experience and enjoyment of the world, thanks to one insightful consultant who gave his brain the benefit of the doubt and the chance to show what it could do with clearer images to work with), adores nursery school, loves chocolate buttons and Mr Whippy ice cream, and will flirt with anything female. And it’s not just Benjamin that has grown this past year. 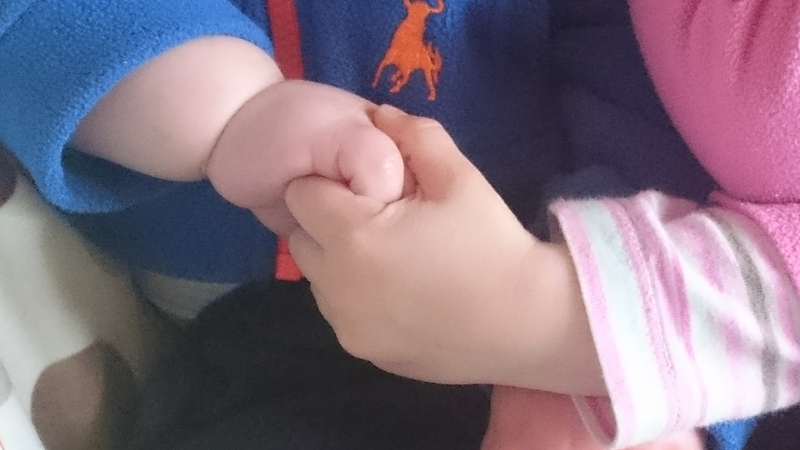 Thanks to the supportive and encouraging doctors at the Edinburgh Royal Infirmary, a lot of heart-searching, the thoughts and prayers of many wonderful friends and family (and a small amount of bedtime action), our little family has grown too. With all this growth have come bigger challenges too. Benjamin needs not just bigger clothes, but bigger nappies, a bigger bed, bigger equipment of all kinds. Instead of our nippy little Mountain Buggy we now have a sort of pushchair-wheelchair hybrid that might look like a mainstream buggy but weighs like a tank and handles like a shopping trolley. And it won’t be long before we have to enter the world of hoists, lifts, housing adaptations and WAVs. The circle of professionals involved in Benjamin’s care also grows ever wider as more and more challenges present themselves. This is a common issue for undiagnosed children – instead of dealing with a single specialist in a known condition, we are sent to a new department for every new symptom. Although we are in the fortunate (and rare) position of having good coordination between most of the services and departments involved in Benjamin’s care, it still results in an awful lot of appointments at an awful lot of different places. Perhaps the most difficult aspect of Benjamin’s care is the never-ending game of catch-up we play as he repeatedly outgrows the dosages of his many drugs. At its most worrying, failure to increase his epilepsy medication in line with his weight resulted in a three-hour tonic-clonic seizure. If his muscle-relaxant isn’t adequate, he can spend days in a state of constant high tone, fighting against his own muscles, drenched in sweat as if he were running a marathon while lying stationary in his bed. We’re always firefighting, waiting for symptoms to occur before we can increase his doses; where pre-emptive increases based on his weight might save him so much pain. And, as each year passes, the developmental gap between Benjamin and his peers becomes ever wider. The stares and comments become more frequent, and the opportunities he’ll miss out on more apparent. 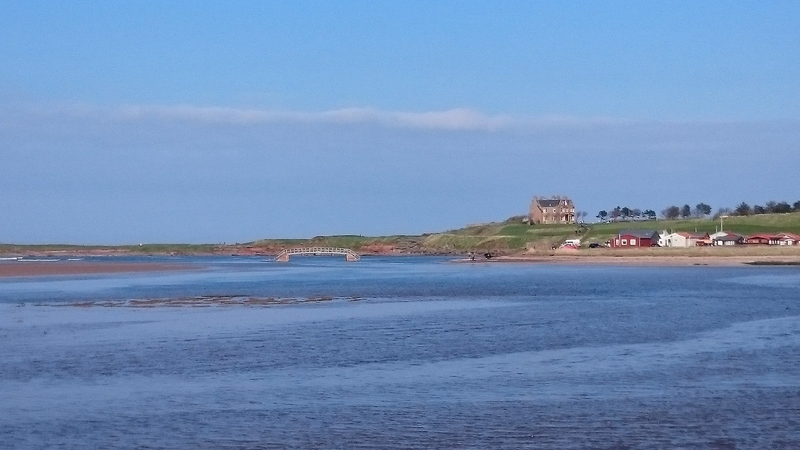 We can no longer carry his buggy over the bridge to our beautiful beach; it won’t be long before he’s too big to lift into the swings at the play park. Already I can see his experiences becoming more restricted by his physical size and ability. Already he’s being overtaken by his seven-week-old sister in motor skills and communication. The year has seen big rewards too: developmental ‘inchstones’ of the kind that mean so much for children without a prognosis. Before this year, Benjamin could only smile at people in his direct line of vision; now he has gained the ability to turn towards someone and flash that smile – a new skill to add to his repertoire of flirting techniques. He’s more interactive both inside and outside the home. He loves to go to nursery – his face lights up when he sees his teacher and realises where he is. 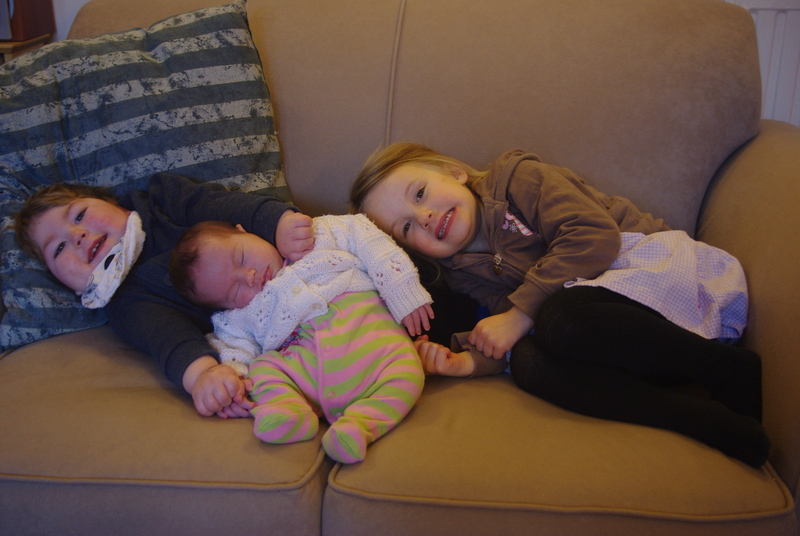 And he’s slowly learning (largely from the noise) that he now has a little sister. 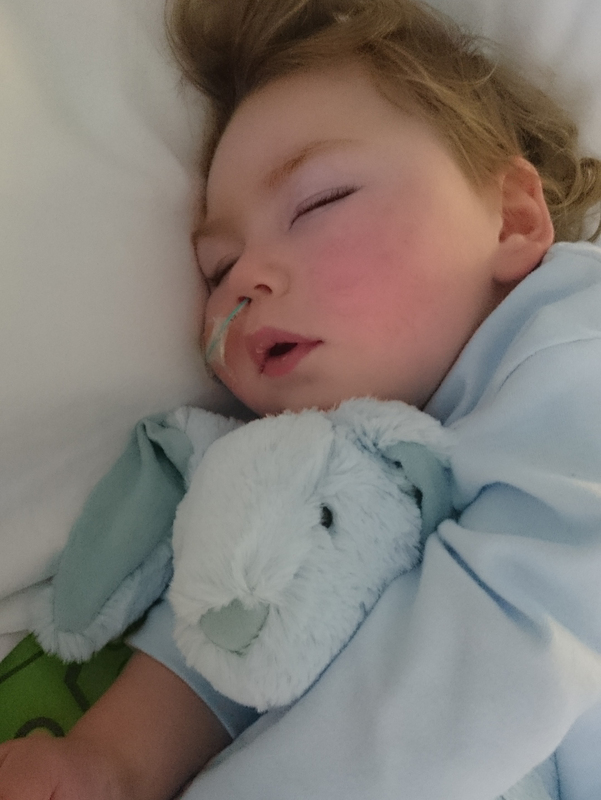 And at last we’re getting some formal support: family breaks at our wonderful children’s hospice, and agency carers to help put Benjamin to bed some nights. Informally, we find ourselves part of a growing community of friends near and far, real and virtual, with whom we share the experience of special needs parenting and the challenges of being undiagnosed. Every day we spend with Benjamin is a bonus and a joy. Every year that passes, we move further beyond our tentative hopes that he might survive birth, a few weeks, his first two years, … No closer to a diagnosis, no nearer to a prognosis, we journey deeper into the unknown. How long will he live? How will he be cared for if he outlives us? Could his condition be passed on to his siblings’ future children? The next year will no doubt bring more big challenges, big decisions, and big rewards (as well as more chaos and a whole lot more laundry…). We’ll become eligible to apply for the mobility component of Disability Living Allowance which, if awarded, will fund a car through the Motability Scheme and should make our lives a whole lot easier. Benjamin will take up a three-year-old nursery placement, fifteen hours a week, which will be a big opportunity for him and a big wrench for me. It will also mean I have the capability to increase my working hours considerably – something I’ll have to think carefully about to work out what’s best for our family. And who knows what new medical challenges it will throw up and what developmental feats Benjamin will achieve? Could the next year bring any more mess? For undiagnosed children across the UK it promises to be big year: with the UK’s first specialist nurse for undiagnosed conditions starting work, we hope it will be a year for raising awareness and improving care – particularly coordinated care – for children with undiagnosed conditions. Could it be the year we make SWAN UK’s big ambition – that all families who have a child with a syndrome without a name have the support they need when they need it – a reality? SWAN UK wants to make sure that every family of an undiagnosed child has the support they need, when they need it. SWAN provides the only specialist support available in the UK for families of children and young people with undiagnosed genetic conditions. They support families in hospital and at home offering 24/7 support and information. 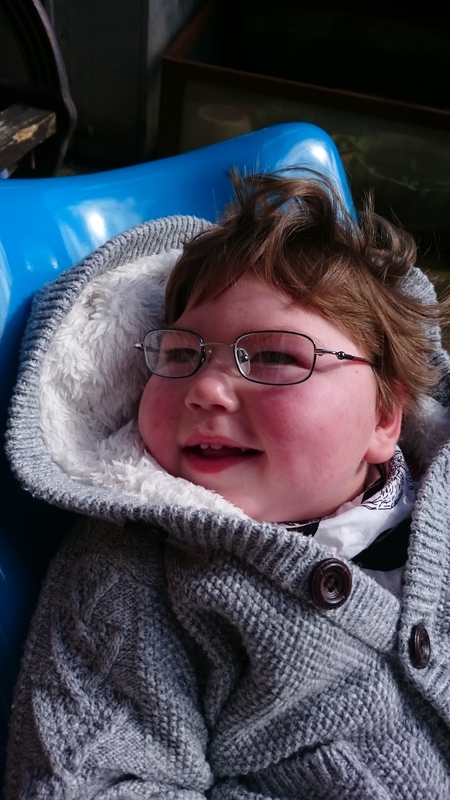 As you know, Benjamin, in common with most other children with rare, genetic or undiagnosed diseases, has a complex array of physical, medical, mental, behavioural and social problems, arising from an unknown underlying cause. These issues are clearly co-occurring and interrelated, but determining how they are related is easier said than done, particularly in a non-verbal child who cannot explain what came first. It’s often a multiple chicken, multiple egg situation. For instance, this week I sat up with him through the night as his muscles tensed, his respiratory rate quickened, his heart-rate raced, his breathing rattled and his temperature fluctuated. Trying to work out whether this is the result of a new medication he is on, a respiratory infection, the old medications not working well enough to control his muscle tone, some new kind of seizure, … Was he in pain somewhere, causing his muscle tone to increase which in turn affected his breathing? Was he brewing a chest infection? Was the new drug causing his temperature to fluctuate? Should I do some chest physio, give him calpol, or call 999? (In the end, as usual, we never found the answer; but a course of antibiotics, a trip to A&E, a good night’s sleep and a lot of cuddles later he seems to be getting back to himself). Following this, when I clearly had too much time on my hands (or rather, was too tired to get on with anything useful), I tried to get down on paper most of the manifestations of Benjamin’s condition (so far). As you also know, alongside each of these symptoms comes a professional, a service, an assessment or a provision. You guys. I’ve added you to my map in green (and some necessary evils in red). And sometimes, with so many of you, I just don’t know which one of you to call. We are incredibly fortunate and so very grateful to have so many people and organisations involved in making sure that Benjamin gets what he needs to lead as happy, healthy, long and fulfilling a life as he can. We are definitely the lucky ones. Moreover, we have experienced fantastic coordination of Benjamin’s care. However, that’s something which, sadly, cannot be said for many disabled people and undiagnosed children in particular. Coordinated care is something that SWAN UK, the support group for families of undiagnosed children, is highlighting this year in the run-up to Undiagnosed Children’s Day on April 29th 2016 (mark it in your diary now!). So, to complement some of the other blogs you may read over the next month highlighting the deficiencies in, and the critical need to improve, coordinated care, I’d like to thank you for the ways in which Benjamin’s care has been coordinated: an example of good (if not best) practice, which perhaps some local authorities could learn from. 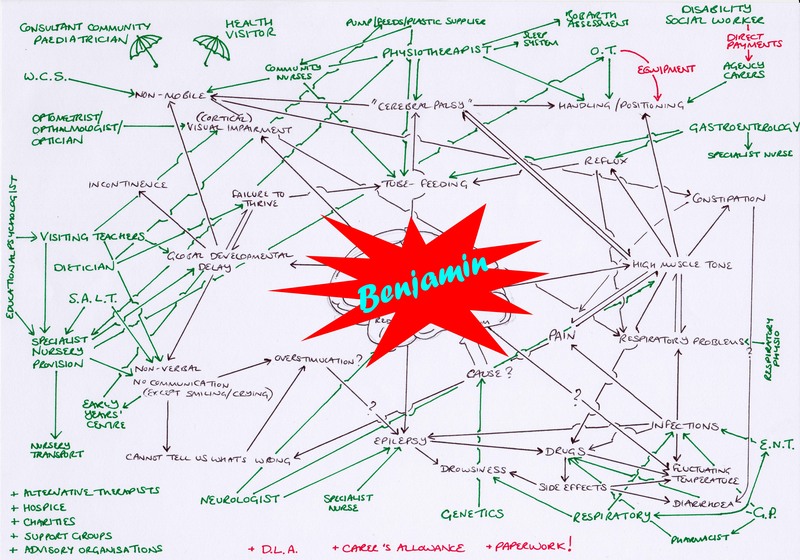 We have a small number of overarching professionals (I’ve marked you on my diagram with an umbrella) who have a good understanding of Benjamin’s condition as a whole. If Benjamin has a problem, or if I have a question, I know these people will do their best to find an answer. If they can’t come up with an answer, they also have the confidence to admit it, and the knowledge to refer us to someone more specialist who might. When I don’t know who to call, I call them. I count our community paediatrician and health visitor as our key contacts, and the latter is our named ‘lead professional.’ I’m pretty sure she wouldn’t need that title to provide us with the help that she does but perhaps, for other children, designating the right person as ‘lead professional’ would be a key step to providing more coordinated care. You all talk to one another. Shock, horror! I don’t mean everyone, all the time: the school bus driver is not in regular discussion with our optometrist; but there is at least some degree of linkage between most of the people in our tangled web of support. Our more regular contacts do their best to attend Benjamin’s Multidisciplinary (medical) and Staged Assessment (educational) meetings, and if they can’t, they send a report or follow-up with me separately. I’ve heard other parents say that they were the only ones to turn up to a staged assessment meeting that should have included at least half-a-dozen professionals. I know these are busy people, but surely they could have sent in an apology to some central organiser, so that someone could twig that attendance would be low and reschedule the meeting for a time more convenient time for everyone? You are contactable and you actually call us back. I do sometimes bemoan the fact that NHS staff never give out email addresses, when it would be so useful and so much easier than trying to phone to reschedule an appointment with a baby screaming, a 13 kg toddler with no head control on my hip, and a pre-schooler decorating the sofa with felt-tipped pen. And yes, we do sometimes receive an appointment letter 48 hours after the appointment was supposed to take place. But generally, your communication is great. I know if I need to speak to someone, I can. Whether it’s to ask the neurologist to tweak Benjamin’s medication, discuss his feed requirements with the dietician, or talk to his nursery teachers about how he got on in class today, I reliably get put straight through or hear back within 24 hours. Many of our community team – the nurses, respiratory physios and the like – will come out to our house, 30 miles from their base, the same day. Finally, and at the heart of coordination, Benjamin’s care is patient-centred. Most of the people we see know Benjamin well and treat him as a whole. You don’t limit yourselves to the isolated presenting symptom that lies within your specialty. Our physio wants to know how his sleep has been, our neurologist makes sure he is up-to-date with any feeding issues, our educational psychologist wants to know what the visiting teachers are doing at home as well as what he is being taught at nursery… With a complex child like Benjamin, this sort of approach is crucial, because more often than not the issue under scrutiny is a manifestation, a sign, a cause or an effect of a problem in a completely different part of Benjamin’s makeup. I don’t know why the system has worked well for us. Perhaps we are lucky to live in a small local authority, with a small number of special needs children, which facilitates a more personal relationship with professionals than elsewhere. I know many families are not so lucky. Time and resources are limited; departments and individuals are stretched. Poor administration, management and support can lead to frequent miscommunication. All this needs to change. As parents and carers we also need to take responsibility for encouraging more coordinated care for our children. We need to ask the right questions, prompt a broader discussion, speak up and not accept the first answer we are given. As a trivial example, early in our journey, one of Benjamin’s challenges was a strong tendency to turn his head to the right at all times. Our physio recommended positioning him so that points of interest (a window, a light, a face) were always on his left, to encourage him to turn that way. A week later, our ophthalmologist proposed always providing visual stimulation to Benjamin’s right, where he could see it easily, thereby providing maximum opportunity to encourage his vision, and his brain, to develop. I never thought to mention to each professional what the other had said, to suggest dialogue between the two or seek a compromise that would be best for Benjamin. I just worried that whichever way I positioned him it would be detrimental to one aspect or another of his development. In the end I decided that, on good days when he was less strongly fixed to the right I would encourage him to turn to the left; on bad days when there was no chance of him moving to the left for anything, I would provide things to look at on the right. At a later date I mentioned my strategy to you both, and you both agreed! Nowadays, Benjamin’s head is usually pretty much central and his vision is vastly improved (unless I’ve forgotten to get his fringe cut…). 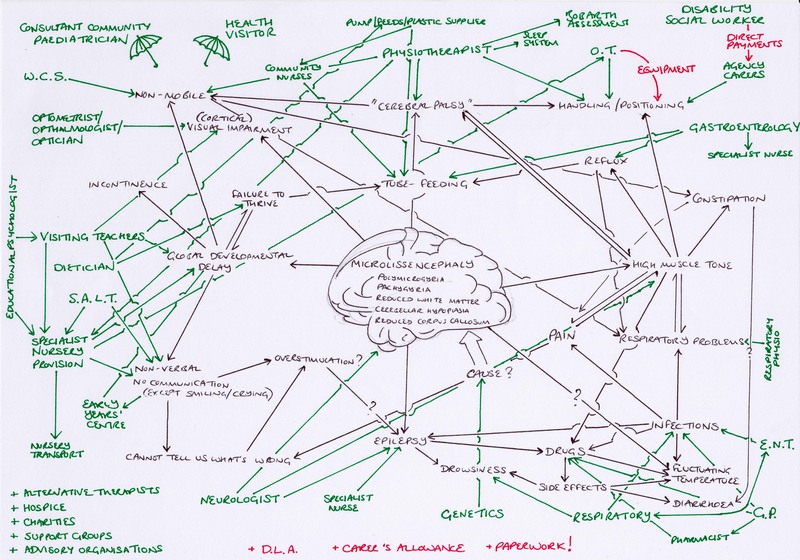 For the 6,000 children born each year with an undiagnosed syndrome, without knowing the underlying cause(s) of their symptoms, with only a sketch-map of the linkages between their problems, with no long-term prognosis and myriad agencies involved, coordinating care is difficult, yes, but oh-so-very important. Thank you for seeing that. Sometimes I just don’t know who to call… but thanks to you I know there’s always someone. SWAN UK wants to make sure that every family of an undiagnosed child has the support they need, when they need it. Undiagnosed conditions have been shown to have a lower rate of care coordination than diagnosed conditions. We want every child and young person with a syndrome without a name to receive high quality coordinated care and support both in hospital and at home. We don’t often think like this. Usually, we put a brave face on it. Often, we are happy. Sometimes, we relish the challenges life brings. We are fighters. But we’ve all had the odd, late night, slightly wine-fuelled, is this it for the rest of our lives? kind-of wobble. Comparative parenting. I say ‘comparative’ rather than ‘competitive’ because we know there is no point competing. But it’s still galling to go to a playgroup and watch his peers laughing, chattering, toddling around, munching on breadsticks. It’s only going to get worse. Mummy guilt. 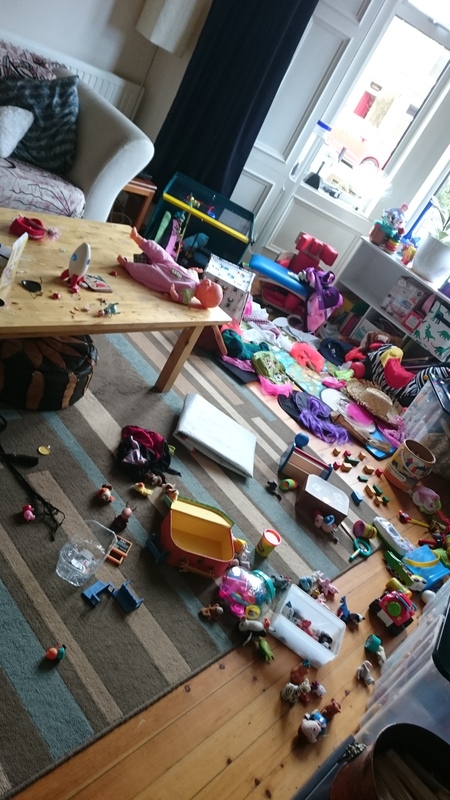 Having a child seems to catalyse a reaction in a woman such that every moment of every day she’s searching for something to feel guilty about: I’m too hard on him. I’m spoiling her. I give him junk to eat. I let her watch Top Gear… Having more than one child multiplies the guilt exponentially. Having an undiagnosed child initiates some kind of factorial equation that is beyond my mathematical education to understand. My other kids are dragged along to so many appointments. I didn’t manage enough minutes of physio today. I haven’t yet applied to this charity to get that funding to go on thither expensive and complex programme at the other end of the country. Is his condition my fault? A hug. A smile. A nod of understanding (real or virtual). A simple answer to a simple question, no questions asked, no judgements made: How to test an NG tube is in the right place when you can’t get anything out of it? How long is it taking at the moment to get an answer from the DLA people? Should I be fighting harder for a wheelchair? Which travel insurers cover undiagnosed medical conditions and which don’t? Getting that special smile, that stiff-armed wave, that baby-bird-like open mouth for his favourite food. And, when his three-year-old sister tells you, despite everything, that he’s her best friend. Friday, April 24th 2015 is Undiagnosed Children’s Day, organised by SWAN UK (Syndromes Without a Name), raising money and awareness for children and their families living with undiagnosed conditions. We might not hit the headlines. Our children might not feature in supermarket adverts or popular novels. But we are SWAN, and together we are strong against the wobbles. Donate to SWAN UK by text: text SWAN11 £5 to 70070. Or donate through our Just Giving or Virgin Money Giving pages.